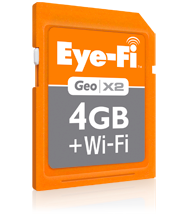 Eye-Fi has announced the Eye-Fi Geo X2, a Wi-Fi-enabled SDHC memory card that will be sold exclusively in Apple Stores in the U.S. and internationally. Set for release in May, the Geo X2 integrates seamlessly with your Mac and automatically uploads photos and videos from your camera directly to iPhoto or one of more than 25 photo sharing sites like MobileMe. The $70 card includes 4GB of storage, and, as part of Eye-Fi’s wireless X2 series, offers speedy wireless photo and video uploads through an 802.11n transmitter. 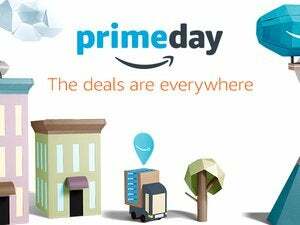 It also includes an Endless Memory mode, which automatically makes space available on the card after photos and videos have been safely uploaded to your Mac or the Web. Living up to its name, the Geo X2 will also include a lifetime geotagging service that uses Wi-Fi positioning to automatically tag photos with the location where they were captured—a feature that will surely come in handy for users of iPhoto ’09’s “Places” feature. Other features of the Geo X2 include wireless back-up; notifications via e-mail, Facebook or Twitter for when your photos are uploading online; and organization of photos in date-based folders. Eye-Fi cards are compatible with most major brand name cameras, but check Eye-Fi’s site to see if your camera is compatible.